Nick Faldo 1993 18 72 6956 40 minutes from downtown. Designed by Nick Faldo, Summit Windmill is one of the most challenging layouts in Bangkok, despite its difficulty, it continues to remain an attraction for all types of players as course conditions are always kept up well. Nick Faldo’s often innovative design also is further characterized by contoured fairways and four excellent quality, water-protected par-3’s, a variety of palm trees line most fairways and give the course a Thailand tropical feeling, with little rough to worry about, golfers can look forward to getting their balls onto the many elevated greens and coping with the undulations. The clubhouse is one of Thailand’s finest, resembling a European castle, some of the golf villas in the surrounding housing estate are just as grand and could easily be mistaken for the clubhouse at any other course. Good views into these homes can be had from many of the holes at Summit Windmill making for interesting walks and when waiting between shots. 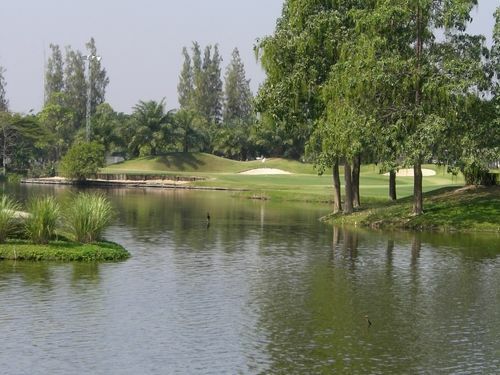 Lighting was installed in 2004 and this makes night golf an option for those with limited time in Bangkok and wanting to get in as much golf as possible, in 2007 course owners appointed Le Meriden Hotels to build a hotel on site. In 2009, the course and hotel will be re-branded as Le Meriden Bangkok Suvarnabhumi Airport Golf Resort. Summit Windmill is popular with both locals who are mostly members and also tourists who want a quick round at excellent course as it just 30 minutes from the center of Bangkok. The golf course is great choice to escape to and enjoy the pleasures of tropical golf course. I just wanted to take a moment to say thank you for a wonderful golf vacation in Pattaya. The only thing I regret is I couldn't stay longer. Thank you to you and your team for your assistance. Copyright © 2007-2019 AsiaLeisure Co., Ltd. All Rights Reserved.